Late one evening, as I lay in bed awaiting sleep, I happened to watch a PBS show highlighting bluegrass and oldtime musicians on stage in small-town Virginia. One act featured a lead vocalist who, singing songs that didn’t seem familiar except in a broad stylistic sense, wailed in a big voice hard to match with the diminutive presence my eyes were seeing. Not only that, but the songs, from what I could make out from the lyrics, appeared way too mature, though as with everything else I was uncertain how old the singer was. As my brain scrambled to make sense of what it was taking in, I wondered, why have I never heard of this person? The episode passed from memory, only to be resurrected months later when Ragged Dreams showed up in my mail for review. Studying the cover photo, I found myself unable to get a fix on just how old the girl — not a woman, a girl — might be. When I put the CD on the player, I recognized her singing instantly. It turns out that EmiSunshine was 12 years old when she cut the 15 numbers that comprise Ragged Dreams. It was with a kind of relief that I found that all of the songs are co-writes, composed with Alisha Hamilton (her mother, I presume) and on occasion one or two others. The backing band is led by her father, Randall Hamilton (bass), with her brother John (mandolin), uncle Bobby Hill (drums) and guest appearances by several bluegrass notables. This is a striking album but also an unsettling one, starting with the first cut, the title tune, which is about grief viewed very much from an adult perspective. In fact, little of Dreams feels filtered through a child’s eyes. The effect is a kind of cognitive dissonance: grown-up themes — jealousy, violence, war, death, heartbreak, natural disaster — and a voice, for all its bigness, still manifestly that of a pre-teen girl. Yet the songs are attention-grabbing and memorable. In particular, “Ninety Miles,” about the struggles of an autistic boy, is almost overwhelmingly sad, and eerily convincing. The production touches on old-time, bluegrass and country (the last, just about pop-free, as heard in the 1960s). One has the clear impression not only of a prodigy — that pretty much goes without saying — but of an early, if more authentic, Dolly Parton, with distant echoes of Sara Carter and Molly O’Day. In other words, old country far beyond EmiSunshine’s young years. Of her song “Porter Wagoner Blue,” she says, “I think Porter and I would have been good friends.” I have not the slightest doubt of that. This is going to be a very interesting career to watch. Good review…..however, Emi does, indeed, write many of her songs with little, if any, help from her mother or other cowriters. I watched her compose both melody and lyrics of “Tennessee Killin’ Song in less than 30 minutes on her bus after she sang a short set at the Bye and Bye in Portland, Oregon in May of 2016. The establishment had named its signature slushie for the day, “Tennessee Killin’ Song” in honor of her love of Apalachian murder ballads inspired by the Louvin Brothers and others. She has been steeped in that genre, among others since she was old enough to listen, along with other types of music, including songs from the late Tom Petty, Dolly, Loretta, Wanda Jackson, Johnny Cash, Porter Wagoner, Buddy Miller, Mike Farris, Merle and Waylon, Marty Stuart to name just a few. She does a smashing Bobby McGee, as well as many Grateful Dead covers. 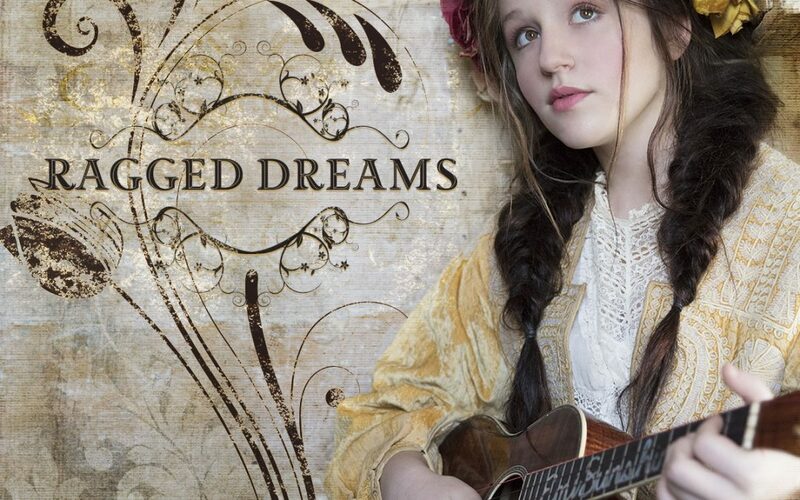 Ragged Dreams, is one of those albums you can listen to over and over, and hear something new each time! I admit I’m a little prejudiced, because I’ve been following her career for over half her life. During this brief period of time I’ve grown to love this sweet,kind,caring,extremely talented,petite young lady,and her band “The Rain” Believe me when I tell you, it won’t be much longer till she’s a household name, Worldwide!!! You have to see her perform live to truly understand, and appreciate, her greatness!! !